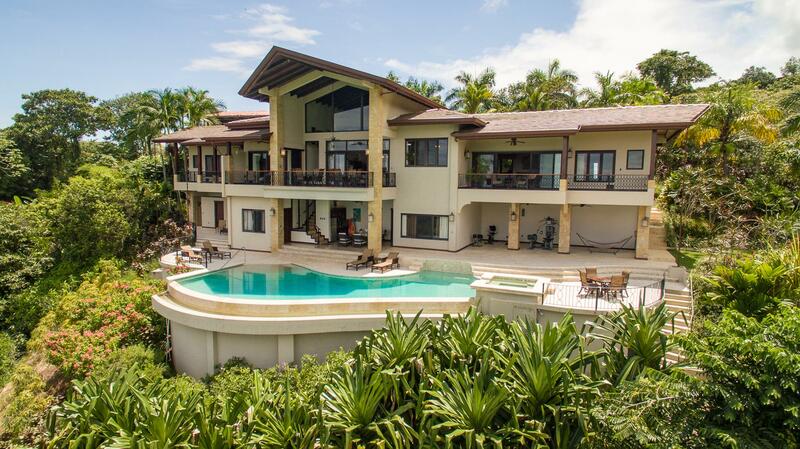 This property is an amazing estate property located just a stones throw from Marina Pez Vela and the world reknown Manuel Antonio National park. This expansive property which is well over a half acre in size offers privacy, security, an abundance of usuable land and a unique combination of serenity and convenience. The home is actually a total of three houses on one property. The main home, is an expansive 3 bedroom, 3.5 bathroom luxury rental property which is perched on the highest part of the property. You enter the fully gated compound and drive up the estate driveway to the carport and main entry of the home. You are greeted by panoramic views of the Fila Chonta Mountain range and Costa Rican rainforest from all sides. the main floor of the home is a beautiful open floor plan, with exotic hardwoods and hosts the cooks kitchen, living and dining area, a guest bedroom with full on suite bath, an office space, and a half bath for guests. There is also a fully laundry and service here on this level. The second floor is a lofted area with two twin master suites, each with their own on suite bath. There is a beautiful and newly refinished pool and jacuzzi area with wonderful decks of the home, ideal for relaxing and watching the sunsets, daily visits from the Scarlet Macaws or to share time with friends and family.